On this page, you'll find funny birthday quotes made even funnier by personal birthday messages — written for you, so you don't have to write them yourself. Wow! 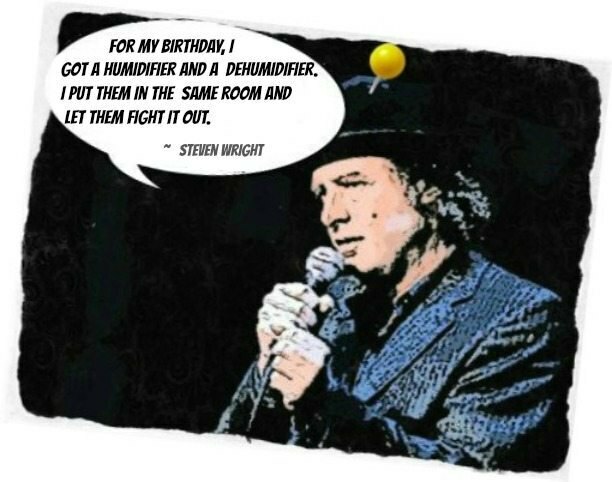 Each famous funny quotation below has a personalized intro and closer that only makes it funnier for the birthday girl or boy. This personal touch also adds much-needed levity to a day that's, for some people, just another reminder of getting older. Now that's a great gift to give your loved ones. This proves that you can't have it all, even if you're a famous rock star. 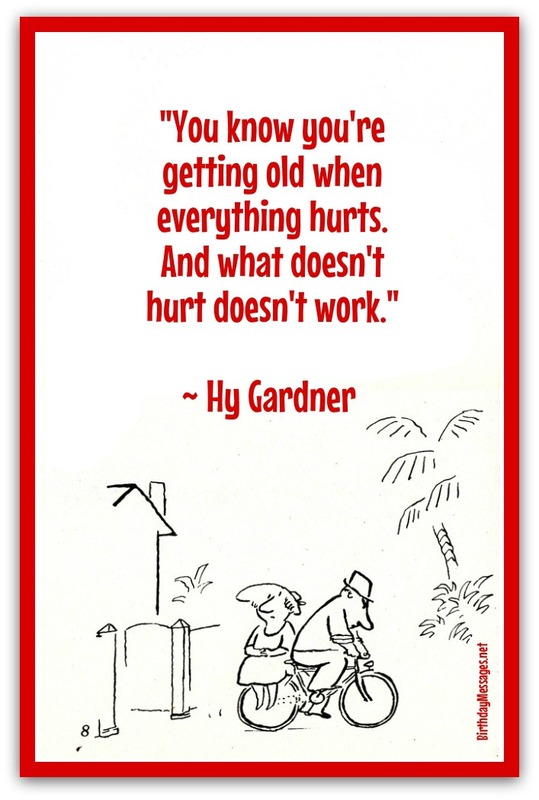 I also mind the aches and pains, but getting older is a lot better than the alternative (you know, teenage acne). Sure, you have some rotten days, but you are the sweetest (insert age) year old I know. Happy birthday! Hey, remember that guy in Japan who lived to 114? You never know. Keep the faith. Happy birthday! 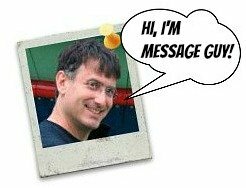 What do you say to people who sound off like this guy? I think there should be a law against this sort of attitude. Celebrate life, no matter how old you are. Happy birthday! This guy has got it all wrong. You know you're getting "old" when a little extra skin ruins your day! I'm just glad I could still feel you pinch me. Happy birthday! Heck, the way we look we'd be glad to get anything, right? Happy birthday! This is why I wear loud colors or barely nothing at all. If you got it, flaunt it...until the day you die (from old age, of course). Happy birthday! Keep searching for the best! And, as we grow older, it's getting harder and harder to hear anything. I'm just glad we're here to kind of hear each other's stories. Happy birthday! Age is really in the eyes of the beholder. I say it's mind over body. You're as young as you feel or fantasize (whatever takes less effort). Happy birthday! This is yet another cautionary tale about following your bliss. First off, this Richard guy has lousy friends. I think you've done pretty well for an old fart. Need free tips on picking funny birthday quotes? 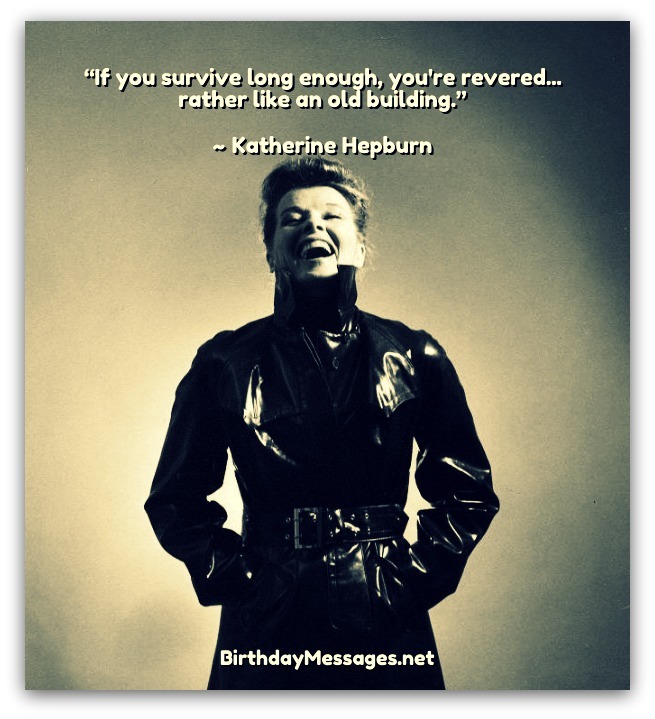 Get free tips on choosing funny birthday quotes right here. Remember, 52 is the new 42 (so tell everyone you're 42). Happy 42nd birthday! Then again, I wouldn't buy the stock of any startups, if I was you. Happy birthday! Like I said, this is why we have scotch and TV! Pass the bottle! Happy birthday! You worry too much about the wrong things. Just enjoy what life has given you and will give you...starting with your birthday. Of course, if I was you, I wouldn't get into any scrapes (or get any scrapes). Happy birthday! Now they don't respect me at all. I'm sure yours think you're just great, because you are. Happy birthday! Of course, as any woman knows, the quote should read "a woman of 29," since no woman in her right mind would admit to turning 30.